Home GForces We’re in the pink, and wearing it too! We’re in the pink, and wearing it too! 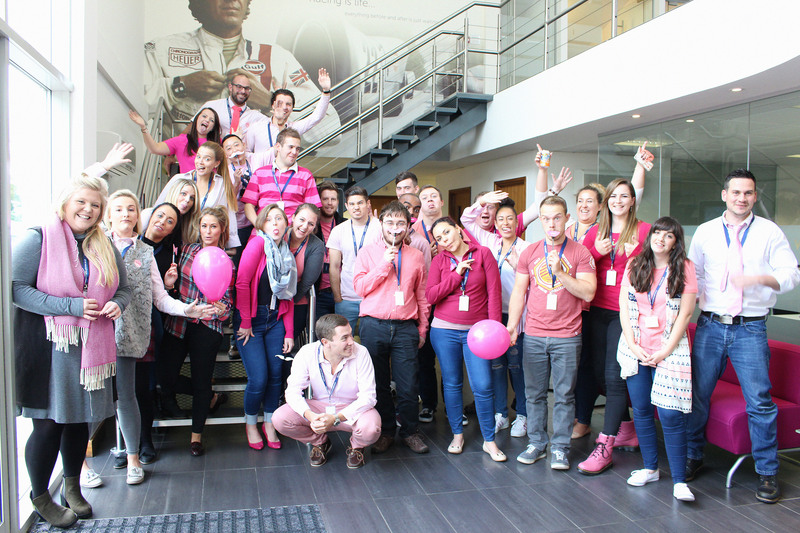 Last Friday, our Birmingham and Head Office could well and truly have been described as in the pink, literally. Not only were we in great spirits, and good health despite it being cold and flu season, but a good many of us were adorned in shades of magenta, coral, fuscia, salmon and strawberry too. This of course, was in aid of breast cancer awareness week. Every day, 140 women are diagnosed with breast cancer in the UK. Every penny raised helps charities like Cancer Research UK improve the odds of survival for each and every one of them. Our newly opened and expanded Birmingham office not only dressed pink, but also combined their fundraising efforts with an equally rose tinted cake and sweet sale. At our Corbin headquarters, everything from hot pink ties to cosy coral jumpers made an appearance. Along with our accessories and props to add to the fun, it was a great cause we were only too happy to get behind and support. Overall, we managed to raise £162.34 and look forward to an even bigger and better event next year. GForces is Europe’s leading provider of digital solutions to the automotive industry. Working with more of the UK Top 200 dealer groups, more OEMs and more international businesses than any rival, we help our clients navigate and maximise their online presence across mobile and desktop platforms.